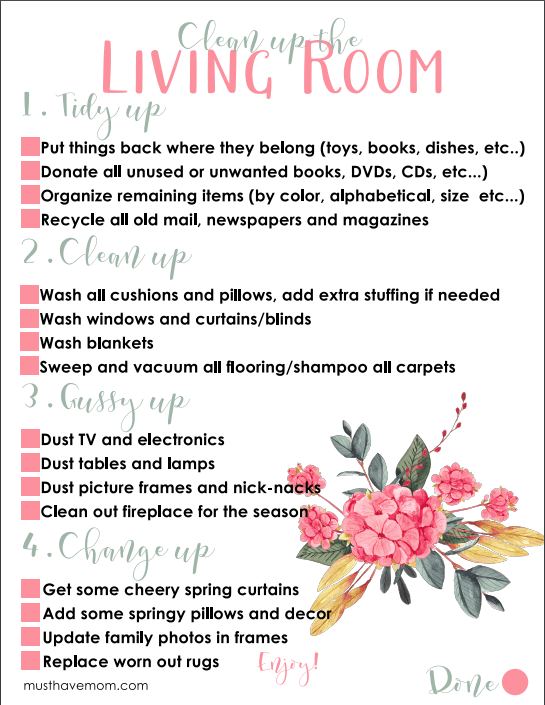 Free Spring Cleaning Checklist Printables – Room by Room! Use the free spring cleaning checklist below to quickly and efficiently clean your house without missing anything! 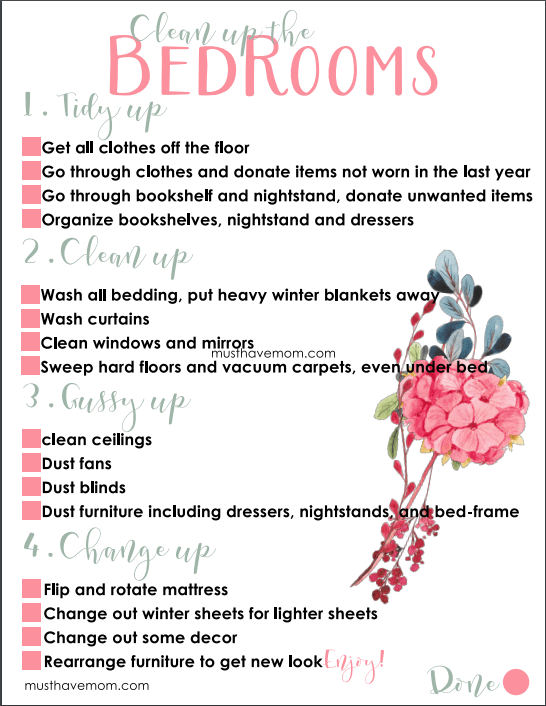 These lists will help you clean room by room and keep track of what’s been done and what’s left to do. The best part? They’re free! Grab them below! After a very long winter here in Minnesota, spring has finally arrived. With the arrival of warmer weather comes a desire to air out the house and give each room a good spring cleaning. Time to get rid of the dust that settled over winter and freshen up each space again. 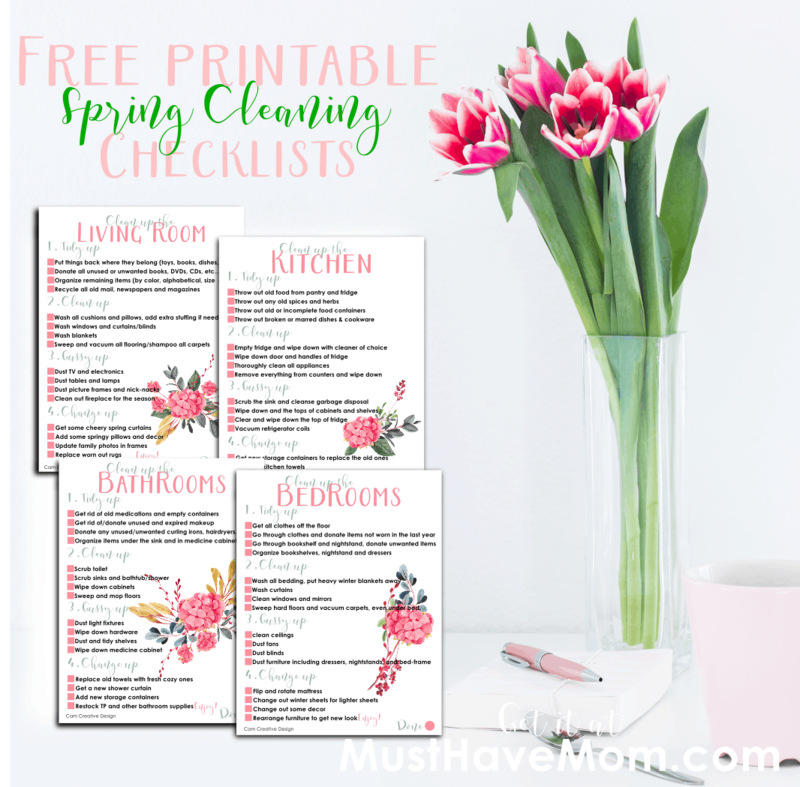 These free spring cleaning printables are the perfect way to stay on track and make sure you don’t miss a thing! 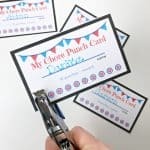 Your house will be clean in no time and you’ll find it’s easy and efficient with these handy checklists. The living room is the main gathering area for your home and probably is the area that will be quick and easy to clean since we tend to “hide” the clutter within the bedrooms and other less-used spaces. Use this living room spring cleaning checklist to make sure you gussy up the entire room. Start by putting things back where they belong. An easy way to do this is to grab a basket for each area of the house that you are returning items to. 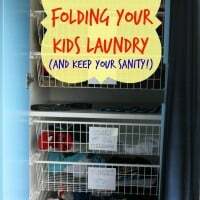 Label them for the kitchen, basement, bedrooms, etc and quickly sort things and toss them in the baskets. Return the items once you’ve gone through the entire living room. This saves multiple trips back and forth between rooms and cuts down on the time spent returning those items to their homes. Donate anything you no longer use. *TIP* Get a receipt for donations made to nonprofit organizations as it is a write off on your taxes! Organize any cluttered areas such as movies, books, etc. Recycle any old newspapers or mail. Next, it’s time to clean. Start by taking down curtains and washing them. If they can’t be washed then vacuum them instead. Do the same with pillows. If any pillows are looking sad add some stuffing to them. Wash the inside of your windows. Vacuum or wash the blinds as well. Wash all the blankets. Dust everything in the room (electronics, backs of chairs, etc). Finish by vacuuming the floor and if you have carpet, shampooing it. If you want to give new life to the room it is easy to change up your decor to give it a fresh, new look. Add new throw pillow covers without having to buy new pillows for an inexpensive makeover. New curtains and inexpensive decor pieces like flowers or plants can breathe new life and color into a boring, dull room. Replace any worn out rugs and update the family photos. The kitchen is the heart of the home where all the magic happens! It’s where families gather around meals and where memories are made. Giving it a good scrub is definitely in order before summer begins. Start by cleaning out the pantry and fridge and tossing any expired food or condiments. Also, check your herbs and spices for anything expired and toss those. Give your dishes and food containers a quick once over and toss anything that is broken or chipped. Donate or toss any incomplete sets such as food storage containers that are missing lids. Once you’ve tossed all the old food from the fridge you can give the inside and outside a proper cleaning. I find it easiest to wash the shelves and drawers in the sink with soapy water. Don’t forget to clean the outside of the fridge too. If you have stainless steel, I love Steel Meister to clean it and make it shiny. Then remove everything from the counters and wipe them down. Scrub the sink (Bar Keepers Friend works great) and if you have a garbage disposal clean that by tossing in some ice and lemons. Give shelves and cupboards a good scrub. Don’t forget to also clean the top of the fridge! Vacuum the dust from the fridge coils as well. Now you can gussy it up with new kitchen towels, storage containers to replace the old ones you tossed, and some new dish brushes and sponges. Add in some new decor or a coffee mug herb garden and you’ve got a fresh, clean kitchen! The bedrooms can quickly become disastrous and it feels so good to get them tidy and back in order again! I hate tripping over legos or trying to find long lost stuffed animals in a messy kids bedroom. You can enlist your kids to help clean their bedrooms too! Let them use this checklist as their guide. If they are younger then delegate some of the tasks to them that they can handle, such as picking up dirty clothes and dusting. Start by getting all the dirty clothes off the floor. Now is a great time to go through the clothes and donate any items they no longer wear or that they’ve grown out of. Go through the nightstand and any bookshelves or cubbies and donate and organize the items inside. Then, wash all the bedding and blankets. Put away any heavier winter bedding. Wash the curtains and then clean the windows and mirrors. Depending on what type of flooring your bedrooms have, sweep, vacuum and mop. Carpets should be cleaned using a carpet cleaner then. Dust fans, blinds and furniture. Don’t forget air vents and hard to reach places. Vacuum the mattress and then flip and rotate it. Consider rearranging the furniture to give the space a new look and add some new decor for a fresh style! I live in a house with 4 boys so I know what I mean when I say that bathrooms can get disgusting. Spring is a great time to get in all the nooks and crannies and be sure it’s thoroughly cleaned! Start by tossing out old medications and anything that has expired, including cosmetics. 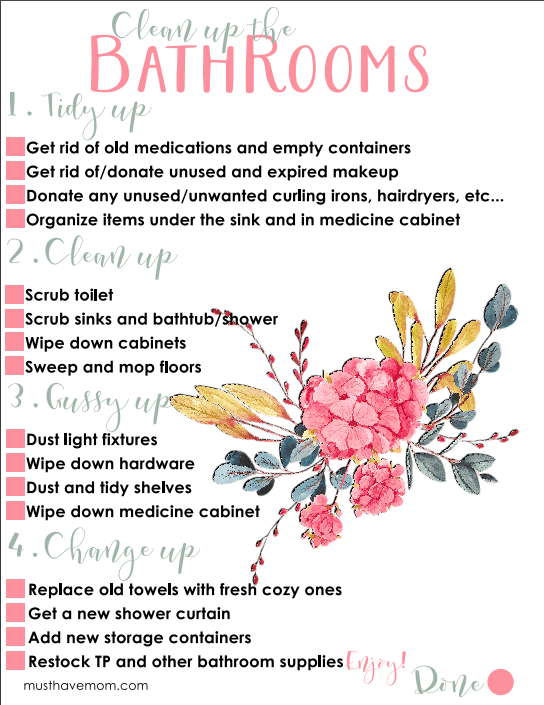 Organize under the sink and in the medicine cabinet. Donate any items you haven’t used in the last year. Scrub the toilets, sinks and tub/shower. Wipe down all the cabinets. Dust and wash any items that may have gathered hairspray residue. Then sweep and mop the floors. Wash light fixtures and shelves. Freshen up the bathroom by replacing towels with new prints. Get a new shower curtain for a whole new look. Add some fun storage containers for organizing and restock any supplies you are running low on. 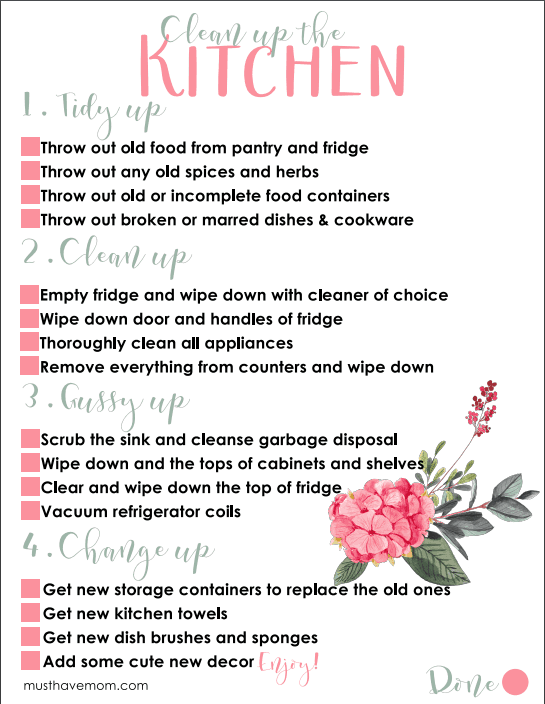 By using these free spring cleaning checklists you can quickly get your house in order and have it looking fresh and clean! I love an organized house and I feel less frazzled when my home is clean and tidy. Don’t make it take longer than it needs to. 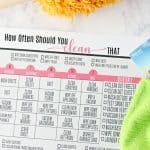 Print these spring cleaning checklists and get started today! 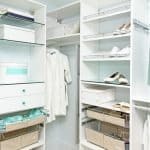 15 Tidying Tips From Marie Kondo That Actually Work!